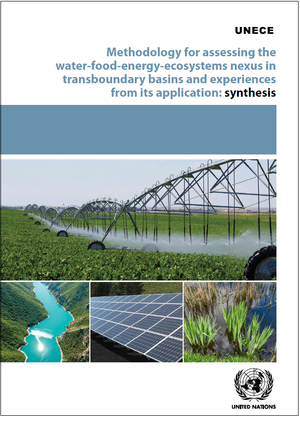 This Synthesis publication covers lessons on interlinkages, trade-offs and benefits in managing water, energy and land/agriculture, as well as on protecting the environment derived from several transboundary river basins in Southern Europe, the Caucasus and Central Asia, and one aquifer system in North Africa. These lessons are the result of the collective experience of Parties to the Convention on the Protection and Use of Transboundary Watercourses and International Lakes (Water Convention) and other States, joint bodies for transboundary cooperation, and other stakeholders who participated in carrying out these assessments from 2013 to 2018. This publication also consolidates the methodology which was developed under the Water Convention specifically for the purpose of assessing nexus issues and identifying solutions in transboundary basins. Its development involved a broad range of expertise, gradual refinement upon use, and an intergovernmental review process. of experiences. The publication also aims to foster follow-up action to the nexus assessments. A key dimension of the methodology is the facilitation of multistakeholder dialogues, which convene sector Ministries from riparian countries with often diverging interests in developing and benefitting from a river basin ̶ be it for irrigated agriculture, eco-tourism or energy generation. With the nexus approach, trade-offs and impacts but also mutual interests are identified. This step is subsequently followed by determining jointly with the authorities and stakeholders packages of policy and technical measures to address the problems identified. This intersectoral transboundary dialogue is coupled with a structured analysis, considering technical aspects and governance across sectors. coherence and achieve co-management benefits. bilateral development partners, and technical experts.